Bulgarian President Rumen Radev is on a working visit to the United States to take part in the annual forum “Honoring the Heroes of the World Campaign Against Extremism and Intolerance” and make a statement. Behind the mundane news reports lies the fact that President Radev is attending the gala and ceremony organized by Irina Bokova, Director General of UNESCO, and the newly established “Global Hope Coalition”, an international initiative dedicated to providing a global platform to bolster the civil society campaign to fight violent extremism and intolerance, preserve cultural heritage, and promote intercultural dialogue. The event gathered over 450 participants in the New York Public Library, among them government and business leaders, cultural icons, philanthropists, and human rights activists. In addition to Radev, the event included Fuad Masum, President of Iraq; Ibrahim Boubacar Keïta, President of Mali; Nana Akufo-Addo, President of Ghana; Marie-Louise Coleiro Preca, President of Malta; Jusuf Kalla, Vice-President of Indonesia; Xavier Bettel, Prime Minister of Luxembourg; Tony Blair, former British Prime Minister; Laura Bush, former First Lady of the United States and many others. Diplomats, with whom Bivol talked, pointed out as outrageous reports that the “fans of global hope” and those of “mainstream politics” had to pay USD 350 to attend the event. In general, attendance of events organized and funded by UNESCO is always free, though strictly controlled through invitations. Meeting Bokova now – an open suicide? 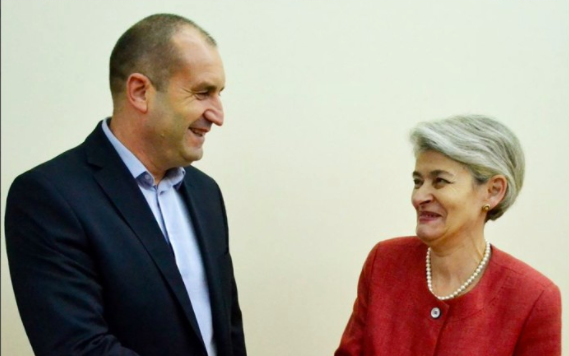 It remains unclear why the Office of the President did not consider it appropriate to promote more Radev’s participation at the prestigious event under the patronage of Irina Bokova, or at least to mention her name in the press release. Bokova, however, lost the battle for the United Nations, and the scandal with money in a Swiss account received by her husband, Kalin Mitrev, from companies linked to the Azeri regime, hit hard on her international reputation at the end of her UNESCO term, as the French newspaper Liberation notes. This might be a possible reason behind the current unusual discretion of the President.